When I first saw these boots I knew they looked a little different. 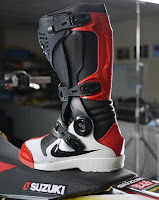 These high tech boots are made by Nike, but they aren't for everyone. In fact, as of now, there are only two individuals "privileged" enough to sport these boots. 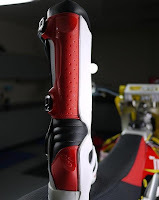 That's because they are made specifically and exclusively for James Stewart and Ryan Dungey. 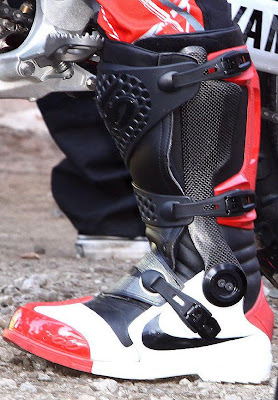 The goal of these boots are to take everything that is needed in a motocross boot while leaving off everything that is not needed to obtain the lightest boot possible. Whether you like the look of them or not, it's hard to argue that they wouldn't give some sort of advantage with the weight savings they offer assuming that they still offer the needed support. 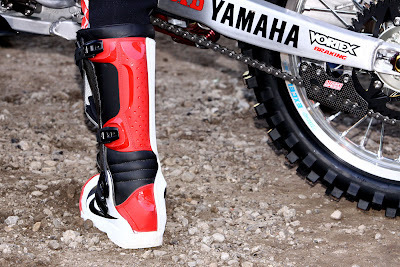 Another goal of the boot was to enhance the feel of the rider to the bike. Do they work? After the first race in Anaheim, Stewart finished first in his class and Dungey finished second. All that can be really said is that they aren't a total failure. I'm not sure how these would hold up in the real world, but if they're good enough for these guys, they must be pretty good. It will be interesting to see if other pros follow suit. Here's some pics from Anaheim Supercross, Stewart in the red and Dungey in the black. I kinda like the look of them. They definitely have a unique, and maybe even a little odd, look to them, but I kinda dig these Nike's. I love those books. They are super unique and the black ones are really pretty cool. so ugly!!!!!! nike should stick to making horrific basketball shoes. Will they ever sell these? They are not planning on it..kind of doubt they will.